As our names implies, big art is our specialty. 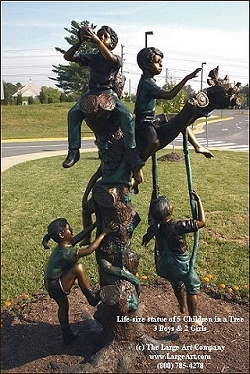 One of our most popular subjects is our life-size bronze children statues. You may have seen some our children statues in other places because the copyrights to these works have expired and the molds are readily available on the commercial market. However, unlike many bronze statue dealers, we work directly with the foundries that cast our sculptures and we only use high quality American bronze. That makes a great deal of difference in the look of the finish and their resistance to the weather elements. As an art gallery we take a great deal of pride in what we sell. Our statues are not mass-produced and we use only the highest quality materials. Each piece is hand-cast one at a time. The bronze we use contains over 90% copper and we can prove it with a verifiable metallurgical report. This may not mean much to you unless you have owned an Asian imported or other low quality bronze sculpture, so let me explain why I bother to point this out. Bronze is a copper alloy, meaning copper mixed with other metals. However, it is the copper that gives bronze its resistance to corrosion and allows it to accept a patina (color). In the United States the minimum copper content for bronze is 90%. However, in many far eastern countries such as Thailand and China they are using recycled copper which is only 60-65% pure. Then they mix it with other recycled metals and the result is a concoction that is a far stretch to be called bronze. Even in the US there are mass-producers of low-quality bronze statuary. When you look at a high-quality piece and a low-quality piece side by side you can easily tell the difference. However, to an inexperienced collector you might think you can save a few dollars by going with the lower quality. 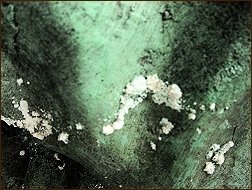 If you buy a low-quality bronze statue, for the first few weeks of ownership you might think you made out OK. Then, you'll see these white spots start appear from nowhere. 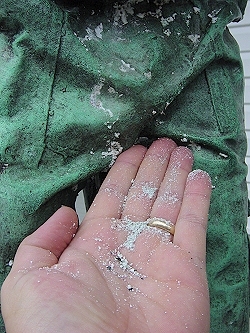 If you are like most people you will try to clean it off. However, in a day or two you will see they have reappeared only larger. If you let it go you will notice that it grows thicker and thicker into a soft white corrosive material that resembles the corrosion on an old car battery, as you can see in the pictures. This is not normal. We don't deal in these types of sculptures so I really don't know what to advise you if this happens to you. I would image a good cleaning and several coats of wax might slow it down, but to be honest I just don't know. I do know it's not good! Now obviously we want you to buy a bronze sculpture from us, so I would understand that you might take this information with some degree of skepticism. However, also understand that as a bronze dealer we could easily carry these low-quality pieces too. It is tempting because the prices are good and there is a wide variety on the market. However, 70% of our business comes from repeat customers and referrals from past customers. I know for a fact if we started carrying these statues this would come to an abrupt halt. In addition, we would be embarrassed everyday to show these in our gallery. We simply don't want to run a business like that.